The United Nations has been a threat to the United States since its inception in 1945. It attacks property rights through its Agenda 21, it masacres and enslaves entire populations of the third world, it fosters wars and undermines the sovereignty of member nations. Through so-called “free trade” it redistributes the wealth of the world amongst its member nations and builds word socailism in the process. The UN attacks our children by driving a wedge into the family unit, it promotes a dangerous educational agenda and pushes world-wide abortion and euthenasia as so called reproductive and family planning rights. The UN also fosters the creation of multi-national coalitions which provides a forum for international bullying that naturally leads to the formation of opposition coalitions and drags our world closer to another major confrontation. 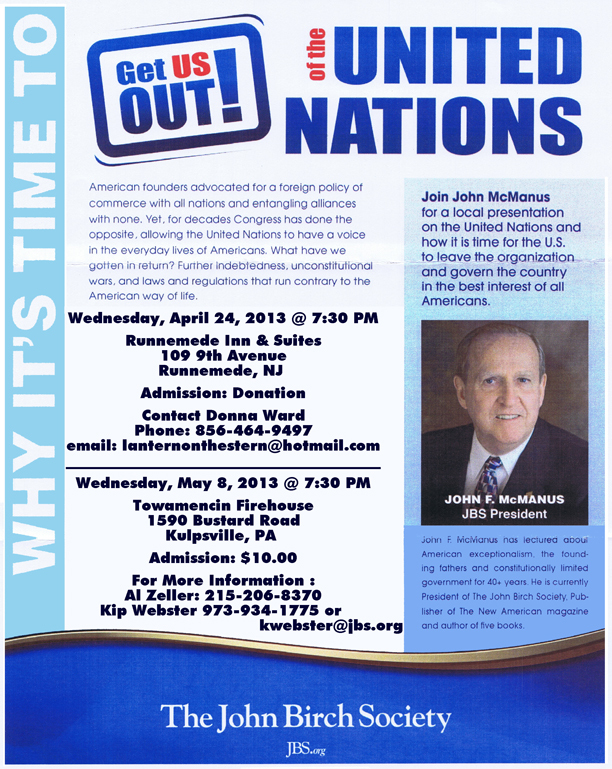 Come hear John F McManus discuss the origins of this powerful institution, its current players and its present threats. Learn how to fight back and rid our nation of this modern day Trojan Horse. Seating is limited, so please reserve early.